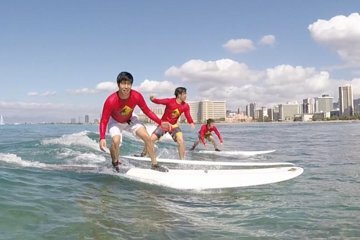 Se proporciona el equipo necesario, que incluye una tabla de surf, un protector contra la erupción y zapatos de arrecife. En la camioneta de surf también se proporcionan videos de instrucción y de surf. This was a great experience. It was very easy to learn and the team was very helpful and encouraging. One suggestion, is if you are prone to motion sickness, take Dramamine before your lesson. You would be surprised to know you can get sea sickness from surfing! Right from the pick up point they made us feel super welcome and at ease. We both managed to get up on the board even though it was a first for both of us. Had plenty of instructors out with us in the water and all were wonderful. Special thanks to Chelsea for the great pics! Would do again! Instructors were amazing! A memory of a lifetime! Surfing area is quite safe with shallow water 1.5m and nice waves 1m. The instructors are very nice and helpful. Enjoyed my first surfing very much. Surfing was awesome! The instructors were great! No experience before this tour and was one of the most memorable things from our trip! Will never forget it! Anyone can do it! This might have been the most fun I had on my week in Hawaii. Sean, Troy and Nick are great teachers, they all bring something a little different in their teaching styles. They had me up riding a wave all the way out on my 7th attempt. Super super fun, cannot recommend it enough. You will fall in love with surfing after this.